Built in 1964, by the Albina Machine and Engine Works Company of Portland, Oregon as the Lassen for River Lines Incorporated of Sacramento, California. She was then acquired by the Willamette Tug and Barge Company of Portland, Oregon. Where the tug was renamed as the Willamette Mariner. In 1988, Willamette Tug and Barge was acquired by the Brix Maritime Company of Seattle, Washington. Where she was renamed as the Jim Moore. In 1993, the Brix Maritime Company was acquired by the Foss Maritime Maritime company of Seattle, Washington. Where the tug retained her name. 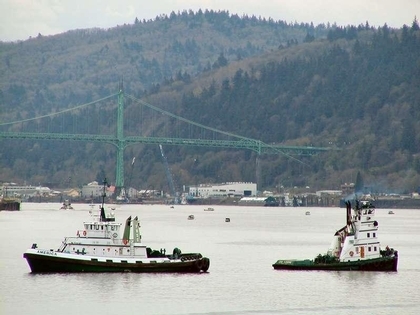 In 2011, the tug was acquired by Diversified Marine Incorporated of Portland, Oregon. Where she was renamed as the Mariner. Powered by two, Caterpillar D-398 Diesel engines. Turning two, 70(in) by 59(in), four-bladed, stainless steel, fixed pitch propellers. She is a twin screw tug, rated at 1,700 horsepower. Electrical service is provided by a CAT D-330 75kW and a CAT D-330 90kW generator. Capacities include 14,000 gallons of fuel, 1,000 gallons of water and 200 gallons of lube oil. The towing equipment consists of a single drum, hydraulic towing winch. Outfitted with 1,200(ft) of 1(in) towing wire.